Brian, how exciting! I can tell you have put a tremendous amount of thought and work into it. I really like the greenhouse you've chosen, when we bought ours the options were pretty limited, not many styles between small home gardener and professional. I'll have to go back and read through this thread more thoroughly. My plants are all in pots, although I've cut out the bottom of some pots to let them root through into the ground, after they took that route themselves, through the holes in the bottom of the pots. The Ceiba and a few cactuses grow this way, some of the cactuses are at the edge of the greenhouse so I worried about them getting cold feet. My guys did not do a good job on the base, it's basically a wooden wall with a little insulation tacked to it. I can feel that the bottom of the gh is cooler, but it hasn't seemed to affect anything so far. Until next fall I am keeping all plants in containers. Once I've seen how well I can maintain temps on the coldest and hottest days of the year then I will start planting in ground. I'm planning to take some temperature measurements in the center and edges of the greenhouse on cold days to see how low it gets. The foundation will be 2ft down and insulated that far so I expect it should stay reasonably warm. If it can't maintain at least 55F I will likely dig again and insulate further next year. Looking at the excavation I can see that below a few inches of topsoil my yard is all heavy, heavy clay. I think I will be amending compost or peat in. I'm talking about doing the equivalent of a raised bed. To be clear, the current state of the greenhouse interior is a slight slope of clay soil with grass lawn on top, covered with a huge mound of dirt from excavation. I can either remove the dirt, level it out, or maintain the slope inside the greenhouse. I'm thinking the irrigation water will tend to pool to one side if I maintain the slope, so it likely makes sense to level it out. If I'm moving all this dirt around it would be feasable to add some organic matter evenly throughout. For example, if there's 2ft deep of insulated soil in the 18x32 perimeter, thats 1152cu ft or 42.6cu yd. So, if the clay soil is 1% organic matter, adding eight $10 3cf-packages of peat moss would push it above 5%. Be sure and post pictures if you can - I love to see what folks are building and how work is progressing!!! Right now I only have an exciting ditch! 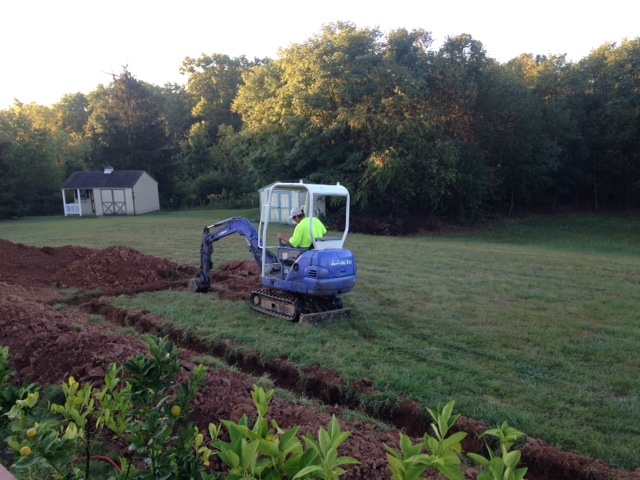 I hired a local excavator to dig foundation and service trenches. I'm starting on concrete forms this week. My brother lives in my old house now, I haven't put it on the market. However, I am planning to revert the old greenhouse back to a normal roof/attic once the new one is vetted. I'll ask a few real estate agents what they think but I expect the answer will be that it will be easier to sell without it. It would be interesting to know what the market thinks. I would like a sunny room like that. Maybe an artist might like it for a studio or someone would like it for a bright craft or workshop. Maybe another gardener will like it. I have been thinking of adding skylights to my garage roof. Anyway, I don't think I would remove the "glass" roof until you test the market for it. It is quite unique. I agree that I hope you can leave the improvement as is. Very unique and seemed very well done. I enjoyed reading about it a while back on the other forum. That data might be lost forever. I haven't been able to log on for weeks (or months). I'm glad Millet got this in place when he did !! Did anybody make a backup of the old site? Actually that really IS exciting! My greenhouse is much smaller (500 s.f), but I dug the ditch by hand, then filled it with gravel by hand, then me and my mom (in her 70's at the time), hauled all the cinder blocks for the foundation, using her little Toyota truck. So yeh, that little excavator is WAAAY cool!!! Loved reading this post so far. Yup, that's what I've been using LaCasaVerde. I hope it is reasonably accurate. I'm thinking of doing water barrels also, though I have more limited space as my greenhouse isn't nearly as large. Actually, because my greenhouse will essentially contain 2-4ft of insulated dirt, it might have a large heat holding capacity on its own. Perhaps the heat capacity of the soil isn't as much as I'd hoped. I am planning to take soil temperature readings until I have a good feel for what to expect. Do you have a concrete foundation? I'm wondering if that will also hold a significant amount of heat. I looked for such a design on a small scale greenhouse with no luck before getting the Nexus Zephyr. The foundation construction turned out to be far more complex than I anticipated. I had spoken to some friends with concrete experience prior to starting but their experience was with pouring slabs which is much simpler than walls. I had to spend a ton of time researching proper concrete form design to ensure they won't burst. I'm getting close to being able to do the concrete pour. The weather is still nice but winter is rapidly approaching. If I don't get it done quick I'll have to resume in spring. In retrospect if I'd hired out the foundation it would only have been a bit more expensive than doing it myself. It sure is a learning experience. I have a handful of people to help me assemble the structure once the foundation is in place. The greenhouse kit should be delivered in the next few days. It took 6+ weeks to manufacture. I put my trees in my old greenhouse for now, so the only urgency is that I hate having incomplete projects. From my calculations heating the greenhouse air should be reasonably affordable because natural gas is dirt cheap. A lot of the efficiencies I though I'd need likely aren't actually cost effective with a fuel source this cheap. I'm not sure about the ground temperature, though. I won't really know until I get there.